I’m always looking for opportunities to encourage a love and curiosity for art in my 21-month old son, Adrian. He’s not quite ready to handle books with delicate pages (he loves ripping them out and then saying “Oh, no!”) so often we read more durable board books. You Are My Work of Art (available in the museum shop) is one of our favorites. 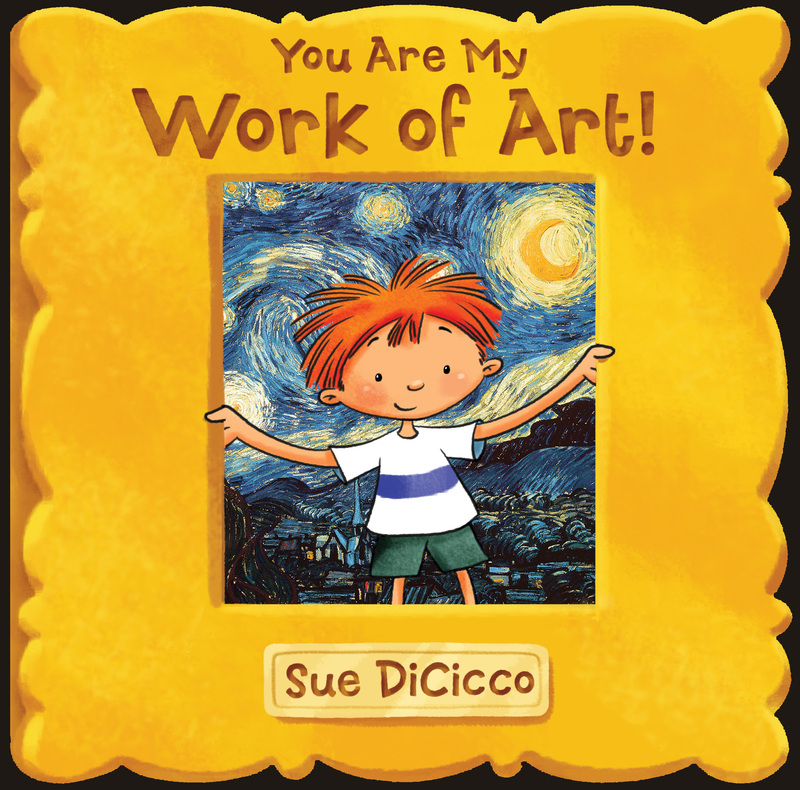 Written and illustrated by former Disney animator Sue DiCicco, the book features eight mostly well-known artworks like Mona Lisa, The Starry Night, and American Gothic. DiCicco places each painting under a flap (yeah manipulatives!) that children lift up to discover the artwork. On top of the flap, she includes a short poem about the picture. DiCicco pairs the paintings with more kid-friendly versions she’s illustrated—think a little girl playing dress-up in her mom’s closet and posing to look like Mona Lisa. Adrian and I love reading this book together. He enjoys lifting the flaps and comparing the pictures. I like that he gets so excited by art. For instance, each time we turn to the page featuring Under the Wave off Kanagawa he yells, “Water!” He also imitates some of the poses; at the end of the book DiCicco includes a Mother and Child painting by Mary Cassatt. Every time we turn the page, Adrian instinctively lifts up his hand and places it on my chin. How could a mother resist any book that guarantees such tender interaction? A group of Florida migrants on their way home to Cranberry, New Jersey, to pick potatoes, near Shawboro, North Carolina, July 1940. Photo courtesy of Jack Delano. Farm Security Administration, Prints & Photographs Division, The Library of Congress. Had the Great Migration never happened, the world may have never known the talents of Toni Morrison, Miles Davis, August Wilson, or Michael Jackson. All of these artists were, directly and indirectly, the product of the Great Migration: a mass exodus of over six million African Americans from the American South to the North that took place from approximately 1916 to 1930. Can you imagine a world without their artistic contributions? This was one of the most salient points that Pulitzer-Prize winning journalist Isabel Wilkerson made in her October 27 lecture at The Phillips Collection on her book The Warmth of Other Suns. The book, which took her over ten years to research, follows the true stories of three individuals who made the journey from the South to the North. Ms. Wilkerson’s novel, praised as one of the top ten books of the year in 2010 by the New York Times Book Review, humanizes the same story that Jacob Lawrence tells in his 1941 work The Migration Series. Hearing Ms. Wilkerson speak was electrifying. An eloquent, poised, and beautiful woman, she radiated an intense yet measured passion for her subject. She praised the courage and determination of those who made the journey from South to North, citing the insurmountable odds they faced when leaving the familiar behind and venturing into the unknown. I got the sense that Ms. Wilkerson, humble and compassionate, is a person who is deeply moved by humanity’s capacity to be extraordinary; she recognizes the understated strength that these individuals perpetuated in the face of adversity. I felt this way when she movingly concluded her talk by saying that the migrants were able to accomplish what Abraham Lincoln’s Emancipation Proclamation could not: the migrants not only found better opportunities, they also freed their spirits, their talents, and in doing so, effectively liberated themselves.